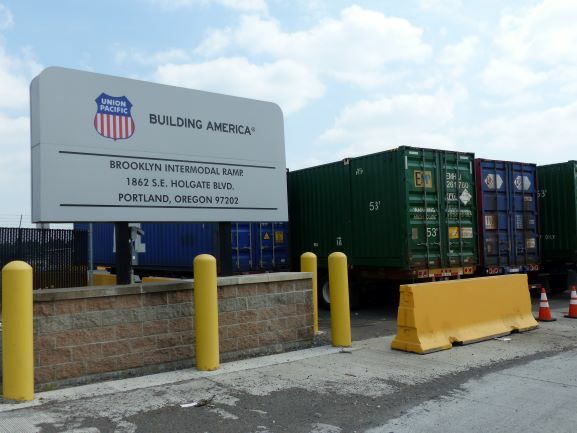 Our neighborhood association (Brooklyn Action Corps) has joined a citywide coalition of neighborhoods to address Portland’s longstanding and worsening diesel pollution problem. On September 26, we hosted a citywide Townhall Forum on diesel pollution, inviting subject matter experts to help us understand the scope of the crisis, and a panel of elected officials and candidates to ask what can be done. 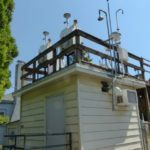 The National Air Toxics Assessment shows that Portland’s airshed is bursting with a toxic stew consisting of dozens of heavy metals and toxic chemicals, including 49 that are carcinogenic. 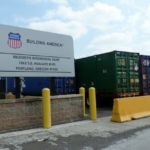 The assessment was based on 2011 data that took several years for the EPA to analyze and compile. What is a diesel particulate? 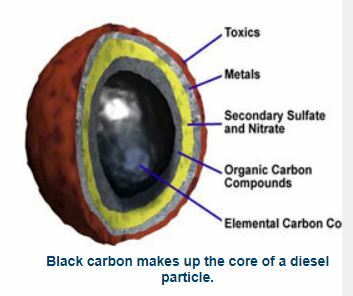 Also know as “black soot,” a diesel particulate is a product of diesel combustion. When diesel fuel is burned, the exhaust contains tiny particles of carbon surrounded by layers of toxic chemicals and gases. Here is a diagram of one diesel particulate. It is 2.5 microns in diameter or smaller. A micron = 1 millionth of a meter. A human blood cell is 6 microns in diameter. A human hair = the diameter of about 28 particulates. Several thousand particulates would fit on a period. Image source: Clean Air Task Force. These tiny particulates evade our body’s defenses, pass through our lungs into our bloodstream, and lodge in our organs, including the brain. Brooklyn and adjacent neighborhoods are severely affected because of the Brooklyn Rail Yard. 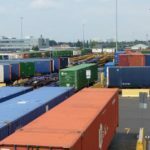 Locomotives idle 24/7, and the majority of intermodal freight trucks serving the yards lack any modern emissions controls. Join our mailing list on the form below, to receive news and updates on this important issue. Here are the information sources recommended by the fact sheet. “Brooklyn Rail Yard Report” (2017) by Creston-Kenilowrth Association. “Airborne Particulate Matter and Public Health” (2015) by Oregon Physicians for Social Responsibility. 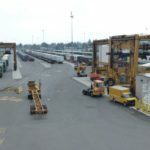 “Portland Area Unfiltered Commercial Diesel Trucks over 26,000 lbs.” (2018) by Portland Clean Air. “Diesel Truck Mitigation” (2018) by Portland Clean Air. “How will Oregon Clean up Diesel Pollution? Volkswagen Settlement Fuels A Fight To Phase Out Dirty Old Diesel Engines” PBS News Hour. 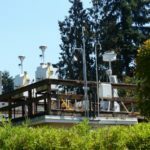 “Portland Scientists to Study Local Threat from Diesel Exhaust” (2018) by Oregon Public Broadcasting. Portland Clean Air (2015). “Industrial Diesel in Portland” with Diesel Particulate Map for Portland, by Portland Clean Air. Neighbors for Clean Air (2018). Linda George, Professor of Environmental Science and Management, Portland State University. Introducing ground-breaking research in measuring diesel particle emissions. Vicki Stone, et. al. (2017). “Nanomaterials Vs. Ambient Ultrafine Particles: An Opportunity to Exchange Toxicology Knowledge.” Contains a sophisticated diagram of a diesel particulate. Can we reduce our exposure to diesel exhaust? Be sure to check one or both of these boxes to specify which list you’re interested in. How would you like to be involved? Check as many as you like. Contact us with any questions by using the form below.